Retro Fighters Launches Kickstarter For Next Gen Dreamcast Controllers! Retro Fighters, the company responsible for modernizing the N64 controller, has just launched a new Kickstarter project! This time around focus has been shifted to the Sega Dreamcast. The Dreamcast had an interesting controller with its inclusion of many modern features, like dual triggers, but also had a strange design and weird cord placement. The Retro Fighters version hopes to fix a few of these flaws with a modern redesign of the original controller. A new layout has been adopted control stick and d-pad have been redesigned. Turbo functionality has been added as well as an extra set of shoulder buttons to mirror the triggers to allow players the choice in button style per game. The cord has also been lengthened and moved to the top of the controller. Retro Fighters has also shared that VMU and Jump Packs are also fully functional to allow for 100% compatibility. As of this writing the Kickstarter has only been live a few hours but has already hit is $13,000 goal! For anyone interested in helping reach any stretch goals or getting a controller for cheaper than retail when they eventually launch be sure to check out the project page. 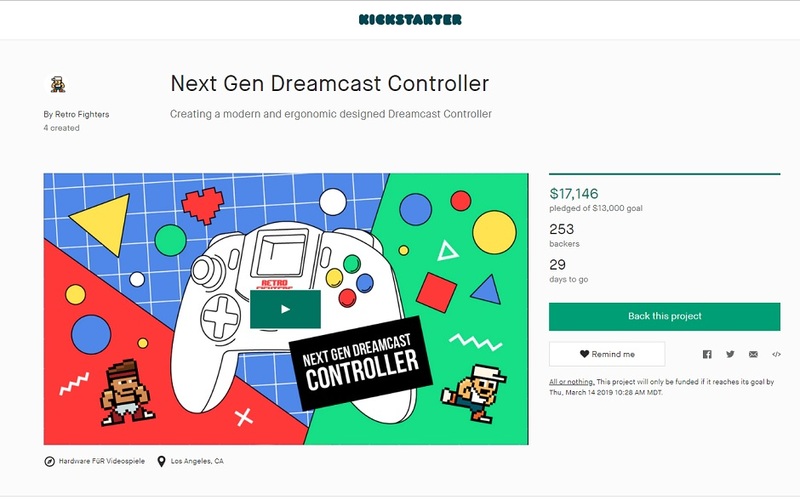 This Kickstarter closely follows the news of Retro Fighters beginning work on a Sega Genesis/Sega Saturn controller. What do you think of the Retro Fighter controllers? Do you want to back this Kickstarter? Leave some thoughts below! Brawler 64 Review: The Best N64 Replacement Controller!